I knew I was in for a treat from the moment I met Megan and Sean for their Historic Harmony engagement session this past winter! (Click here to check it out!) Kind, gracious, generous are just a few of the words I would use to describe this pair, and let me tell you - their friends and family fall right into that same category! Megan and Sean's wedding day began with the ladies getting ready at Megan's parents' house - which just so happens to sit right on the edge of the Butler Country Club golf course! Her parents' house made the perfect backdrop for her gorgeous and classic bridal details - ranging from a dress bought at Kleinfeld's to the most beautiful jewelry and accessories! Though the threat of rain loomed throughout the day, it only sprinkled for all of five minutes on their day - regardless, Megan's parents have the most BEAUTIFUL front porch that we used from practically every angle for photos! The ceremony took place at First United Methodist Church in the heart of Butler, which included a few personal touches, including a song sung by the bride's brother. It was beautiful! 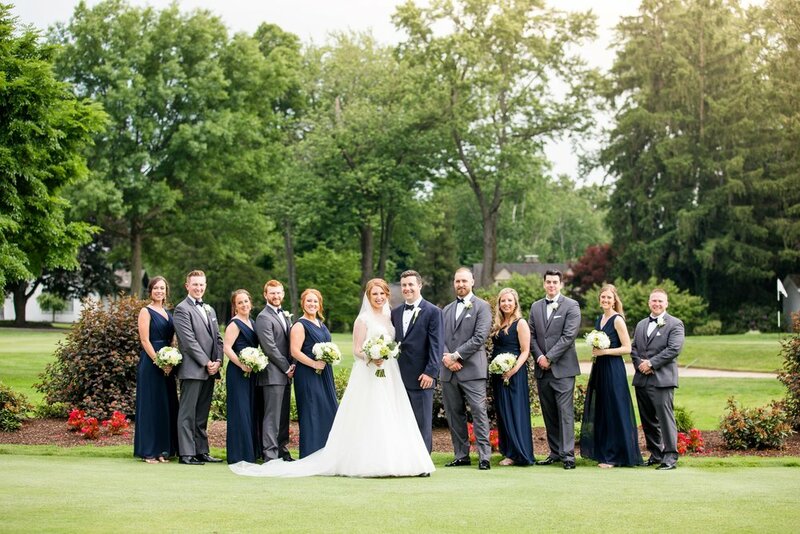 After their formal exit, we headed back to the Butler Country Club for photos around the property, followed by a reception in the grand ballroom. The room was decked out in beautiful florals (by Julie James) and The Elite Show Band brought so much life to the party! There's nothing quite like a live band at a wedding! Congratulations on your wedding day, and more importantly, on your marriage, Megan and Sean! Praying all the best for you two as you move forward into this next adventure!